Creating mock scrapes is a tactic that is highly under-stated and under-used in the majority of the hunting community. Although this tends to work best during pre-rut situations, it can provide results right through the rut as bucks travel in search of receptive does and work scrapes along the way. 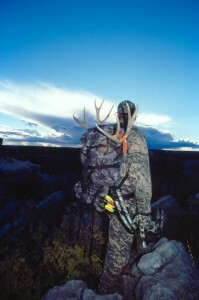 The first consideration is of course whether or not your hunting area holds any sizable bucks to begin with. By sizable we don’t mean large antlers. Simply put we mean anything you would shoot that meets your own standards according to your own personal code of ethics. For some a forkhorn is a true trophy. For others nothing less than a record book is suitable. You hunt according to your ability and the deer in your hunting area harvesting those which you consider sizable or suitable for shooting. Scrapes will work on all deer but predominantly work better on larger class older deer that have laid claim to one particular area. A scrape is considered a calling card much like a rub on a tree but is a bit more in-depth once you take a closer look. When a buck works the ground he is leaving a visual sign that he considers this area his, much like a rub. You also find that they leave their scent in the scrape as they do when making a rub via their pre-orbital glands. So how do scrapes and rubs differ? For one it is seldom that rub will be worked again later in the year. A certain tree may be rubbed in consecutive years but seldom is it ever worked again during that same year. Not so when speaking in terms of scrapes. Although not all scrapes are re-worked, a percentage of them are visited throughout the season and freshened when needed. You will also find a licking branch above a scrape where the deer has chewed the end of a small branch and worked his pre-orbital glands as well as the glands found around his tear ducts to leave an added scent. This is where scrapes and rubs differ the most besides the fact of re-visitation on occasion. Scouting and finding a scrape or scrape line is a definite plus. I would much rather find a scrape or two than a rubline. Many times you find that rubs were a relief for pent up aggression due to growing testosterone in the buck while the scrapes are a definite sign that a buck likes what he has seen in the area. Scrapes are normally found on higher ground that is dry enough to hold scent and wont be washed out in the even it rains heavily. Areas that repeatedly encounter boggy or swamp-like conditions hold less scrapes than the edges of that same area where the ground is slightly elevated. Any edge of a field, especially those that contain row crops or food plots are high percentage areas to find scrapes. Main trails entering swamps are also likely places for a scrape or scrape-line. But is finding a scrape a call to set up your equipment and start hunting? Not exactly. The percentage of scrapes that actually get re-worked is low in most places but there are a few tactics for increasing the odds and finding out just what scrapes are still active. One method for revealing an active scrape is to cover it with leaves and re-check it again in a few days. This is the most basic approach in finding out whether the buck is still in the area and visiting his scrapes but we’ll look at more indepth techniques in a moment. If you find the scrape has been freshened upon returning you might want to set up and have a look at what class of buck you’re dealing with. It’s not unheard of for a smaller, or larger, deer to come by and leave his own stamp directly over another bucks scrape. 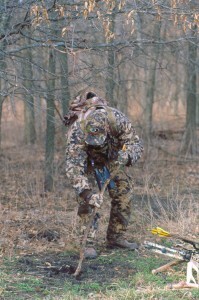 Set up downwind of the scrape as most bucks wont approach directly and prefer to use the wind to check their scrape. The main objective here isn’t so much the visibility of any scrape but the scent that’s contained within. If you objectively look at a scrape on the ground, it isn’t going to draw much attention visually, as a rub does. The secret to the scrape lies within the earth itself discernable mainly through scent. That’s how you concentrate your efforts when creating a mock scrape. You’ve found an active scrape but hunting the area has proved fruitless. Chances are that the buck is checking them during hours of darkness. So how the heck do I lure the buck out without alerting him? There are a number of ways to tackle this situation. First you want to make the buck believe that another buck has taken over his area. You can do this by either working his active scrape or creating a mock scrape. Both can be perceived as the same technique but when creating a mock scrape you start from scratch, just as the deer did. We’ll discuss that first. To create a mock scrape you need to be very careful about leaving any human scent. Rubber boots and gloves are not an option. They are a necessity! Begin with choosing an area similar to the scrapes you’ve found. Be sure there is a licking branch located roughly 40 inches above the area to be worked. Start out by working the ground with the heel of your boot to reveal some fresh dirt. Typically this would be done is a somewhat circular or oval pattern. This does not have to be a hole in the ground! Simply removing the top layer of grasses or moss will work fine. Because a buck urinates in his scrape you will need some scent. I recommend the liquid formula for this application as opposed to the gel version. Vigorously douse the fresh dirt you opened up with the urine. No need to mix it in the dirt. Just let it soak naturally as the buck would. Alternatively you can use a commercial product called Primetime Magic Scrape or any similar product. These are advertised as weatherproof scent dispersing soil. Personally I have never used these but others who have claim great results with less hassle. Next you need to work the licking branch. Just gnarl the end of the branch by twisting the limb in all directions until you can remove a small portion. A manufacturers preorbital gland scent can then be applied to the end of the branch to complete the scenario. Some hunters prefer to use a drip bag or other means to ensure the scrape remains fresh with their scent but that is a personal preference. I prefer to create the scrape as described then walk away. Check the scrape every few days for activity. If you find that a buck has come by and worked the mock scrape, freshen it and hang your stand. Chances are you might get a look at the buck if he’s actively patrolling the area. 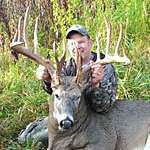 To really set a buck into a frenzy you have a number of options but here’s my favorite. If you’ve done any scouting throughout the year chances are you have a few places to set up and hunt from for various weather conditions. Hopefully those places also contain a high volume of deer sign including some scrapes. If so, hers a extreme trick to really throw a dominant buck into hyperdrive. Take two different scrapes from different areas preferably a minimum of 1 mile apart or more to avoid the possibility of using the same bucks scent from his home-range. With your scent-free gear and a hand trowel or small shovel dig up the dirt from the first scrape down to a depth of at least 6 inches and put it directly into a plastic bag. A small trash bag works well in most cases. Return to your other hunting area with the dirt you’ve just dug up and do the same. Pour the dirt from the first scrape into the second scrape and pat down to a fairly firm consistency. Now re-visit the first scrape and fill in the hole with the dirt from the other scrape in the same manner. Because you should be well out of any overlapping home-range of either buck, they will perceive this as an intrusion. This should bring at least one of the bucks back to actively begin working that scrape again. Keep in mind that unless the 2 bucks are fairly evenly matched, you will probably chase the smaller one away, which in this extreme case, you want to know which is the bigger or dominant buck to begin with. Now in most cases this technique will work to some degree but not all. I have seen a spikehorn work a scrape that was made by a large 6 point buck. In the same breath I have seen much larger bucks approach the new scrape very tentatively. Given that information its hard to justify whether the buck picks up small traces of the human scent in the new scrape or he’s just cautious for the fact that he’s not the dominant buck in the area. In any event, realizing what scrapes are and how they provide a means of communication in the world of deer will only boost your knowledge to a higher level. Experimenting and taking notes will increase not only your knowledge level but also your confidence. The next time you’re out scouting and come across a scrape take advantage of the situation by first examining the situation, then putting this information to work. You could very well find yourself hot on the heels of the dominant buck in the area!